All transactions are safe and secure with a reliable history in online purchasing behind each of our associates. Buy the Moustache & Shake Movie Quote t-shirt to own There Will Be Blood clothing and merchandise. This funny tee features a silhouette of a milkshake with a long straw sticking out of it. The drinking straw leads up to Daniel Plainview's moustache, which rests above his movie quote from There Will Be Blood. 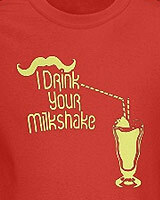 These I Drink Your Milkshake t-shirts are available in a variety of colors and look great in black. In the movie, Daniel uses the analogy of the long straw and the milkshake to represent how he was able to drain Brandy's land of its oil through the surrounding wells that he owned. In addition to the Moustache & Shake Movie Quote tee above, browse the There Will Be Blood Clothing Gallery for more apparel like men's and women's clothes, kids shirts or hoodies.